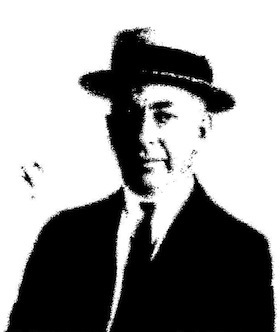 In the course of researching Sport Sullivan’s life, I became curious about the Arnold Rothstein associate “Nat Evans,” who allegedly was sent by Rothstein to monitor Sullivan and monitor how the 1919 World Series fix was going. Who was this Nat Evans? Why did Arnold Rothstein — not known to be trusting — trust him to monitor the Fix? The writer Damon Runyon often wrote of his friend Nat Evans as a genteel, “high-class sporting man … one of the nicest chaps I ever met.”1 But this genteel façade concealed a checkered, often violent, past. The bottom line is that Nat Evans was a large-scale operator in his own right, someone who moved in the highest social circles, and had plenty of experience in betting, plenty of experience in illegal activities, and plenty of success dodging the law. In short, Evans was someone Arnold Rothstein could trust to look after (Rothstein’s) interests in the World Series fix. Nathaniel Isaac Evensky was born on April 11, 1876,2 in Russia, the son of Julius (aka Jacob) and Libby (Margolin) Evensky. The family emigrated to the U.S. in 1883, settling in St. Louis, where the elder Evensky and Nat’s brother Morris set up a tinware shop. The first sure newspaper notice we have of Evans is his coming to Tampa, Florida, around 1902. He and his partner, Jake Goldstein, are reported as well-known Tampa gamblers. Some newspaper articles assert that Evens/Evans (the newspapers generally use the latter, more familiar spelling) is well-known in Southern “sporting” circles even at this early date. By 1906 Evans and Goldstein had set up yet another gambling den in Atlanta. The trade proved so brisk that they relocated to a larger mansion on the outskirts of Atlanta. “The Merchants Recreation Club” proved so popular that in several months, the partners allegedly cleared “a cool $100,000.” The club was “one of the most sumptuously furnished ever seen in the South. Every known paraphernalia for gambling was there, and fine drinks were served to the patrons.” According to the police, the paraphernalia included marked cards and loaded dice. Evans and Goldstein were arrested, released on bond, and later indicted, but by that time the partners had moved on and they were never brought to trial.9 As can be seen, Evans had a track record of evading jail time. Evans quickly established himself in New York society – or, at least, the raffish, new money part of society. Just before Christmas 1912, Evans, millionaire George Young Bauchle, playwright Wilson Mizner,11 and well-known bridge player John Shaughnessy (written up as four prominent “society” sports) were drinking at Rector’s Hotel in New York City when the conversation turned to the upcoming holidays. The group agreed they’d rather be somewhere else for Christmas, whereupon Bauchle, known for his madcap wagers, bet the group $1,000 each that they wouldn’t go right from the hotel, with just the clothes they had on, and take the Mauretania to Europe. 1 Damon Runyon, “The Brighter Side,” Chester (Pennsylvania) Times, July 26, 1937; David Pietrusza, Rothstein: The Life, Times and Murder of the Criminal Genius Who Fixed the 1919 World Series (New York: Carroll & Graf Publishers, 2003), 95. Runyon usually referred to him by his adopted name of Evens. It is said that Evens was the model for characters later made famous in the musical Guys and Dolls. 2 He gave his birthdate uniformly as April 11, but the year varied from 1876 to 1880. On his World War I draft registration he gave 1877, on his 1920 passport application 1879, and on his 1927 passenger list, 1880. On these documents he claimed to have been born in St. Louis and/or Missouri. The middle name is from the New York Sun, February 21, 1918. This biography is adapted from my article “Nat Evans: More Than a Rothstein Associate,” Black Sox Scandal Research Committee Newsletter, June 2014, 14-17. 3 Evans may also have tried to disguise the New York origins of the Fix by having the heavy betting coming from St. Louis gamblers with no known connection to Rothstein. 4 Per his death certificate. In 1924 Evans married again, to Cuban-born Mercedes Esqueu. 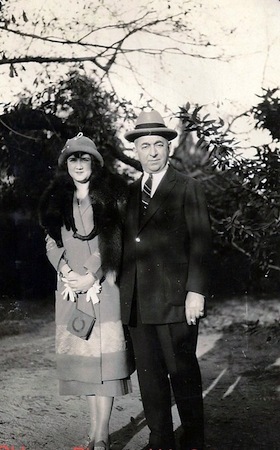 The couple divorced by 1930. His early years have heretofore been shrouded in mystery, so much so that even his descendants are unsure what he did. Great-nephew Devin Evensky said brother Morris disapproved of Nat’s gambling, and the two drifted apart. 5 “Pistols in Play,” Tampa Tribune, June 30, 1903. 6 “Nat Evans Heavily Fined,” Macon Telegraph, November 7, 1903. 7 “Doss is Robbed While He Is Dying,” Macon Telegraph, December 25, 1903; “Nat Evans Acquitted,” Macon Telegraph March 20, 1904; “Evans’ Trial Begins Today,” Atlanta Constitution, February 9, 1904; “Nat Evans Acquitted in Savannah Yesterday,” Augusta Chronicle, July 15, 1904. 8 “A Gambling House Raided last Night,” Augusta Chronicle, January 31, 1904; “Gamblers in Hard Luck,” Tampa Tribune, February 2, 1904. 9 “Gambling Dens for Atlanta?,” Atlanta Constitution, October 21, 1906; ”Many Indicted in Gaming Case,” Atlanta Georgian and News, March 9, 1907; “Goldstein and Evans Indicted,” Augusta Chronicle, March 10, 1907. Evans is not on the 1910 census, at least under his own name. Being under indictment, he had reason to lay low. With his extensive Southern gambling connections Evans is clearly the “old friend” for whom Abe Attell kept silent about the Fix for as long as Evans was alive. See Damon Runyon, “Attell Keeps Secret of Black Sox Scandal,” Washington Post, October 4, 1939. Attell said as much in his statement to writer Eliot Asinof in 1960. See Asinof papers, Chicago History Museum. 10 Pietrusza, Rothstein, 93. “Raid Hewletts Casino Again,” New York Sun, August 28, 1911; For another raid, see “Prosecutor Weeks Raids Holly Arms,” New York Sun, August 12, 1919. 11 The Sondheim musical Road Show is based on Wilson Mizner. 12 Pietrusza, Rothstein, 96. See “Legend of a Sport,” New Yorker October 24, 1942, 25; “Take Trip to Europe After $1,000 Wagers,” New York Evening Telegram, December 20, 1912. 13 “Sailed With Only Clothes They Wore,” Salt Lake City Telegram, December 20, 1912. Evans, Mizner and Shaughnessey returned to New York on the Kaiserin August Victoria, which sailed from Cherbourg on January 19, 1913. The passenger list shows “N.I. Evans” 36, born St. Louis, residence 156 W. 44th St., NYC. 14 “Heavy Gambling on Baseball Race With Giants Favorites,” Greensboro (North Carolina) Daily News, June 8, 1913. 15 “Reform in Saratoga,” Ballston Spa (New York) Daily Journal, May 6, 1921. 16 “Kitty Paid for $30 a Plate Dinner at Partridge Club,” New York Tribune, February 21, 1918. “More Big Hotels Harbor Gambling, Swann Charges,” New York Tribune, February 23, 1918. 17 Pietrusza, Rothstein, 124-125. See also Jon Bartels, Saratoga Stories: Gangsters, Gamblers & Racing Legends (Lexington: Eclipse Press, 2007). 19 Abe Attell statement, September 29, 1960, Asinof papers, Chicago History Museum. Abe Attell, “The True Story of the World Series Fix,” Cavalier magazine, October 1961. See also William F. Lamb, Black Sox in the Courtroom (Jefferson, North Carolina: McFarland & Co., 2013). William F. Lamb, “A Black Sox Mystery: The Identity of Defendant Rachael Brown,” Base Ball, A Journal of the Early Game, vol. 4, no. 2, Fall 2010, 5-11. 20 Ray Gillespie, “St. Louis Policeman Recalls Details of Black Sox Case,” The Sporting News, October 9, 1957. "Four New Yorkers Held / Arrested in St Louis on Suspicion – Evans Denies Baseball Bribery,” New York Times, April 2, 1921. 21 Lamb, Black Sox in the Courtroom, 99. 23 “Andrus Trial Next Monday,” Ballston Spa Daily Journal, May 2, 1921; “Reform in Saratoga,” Ballston Spa Daily Journal, May 6, 1921; “Andrus Case Will Go On Tomorrow,” Saratoga Springs Saratogian, May 10, 1921. 25 “Cuban Track Heavy,” Daily Racing Form, December 4, 1924; Damon Runyon Columns: “Runyon,” Chester Times December 29, 1932; “Runyon,” Chester Times August 4, 1934; “The Brighter Side,” Lowell Sun, September 18, 1944; “The Brighter Side,” Indiana (Pennsylvania) Evening Gazette, April 8, 1946; Tom Akers, “Agua Caliente Jockey Club Head Makes 2 Important Announcements,” San Diego Evening Tribune, December 16, 1932. 26 Lamb, “A Black Sox Mystery”; “Boxers Are Ready for Garden Bouts,” New York Times, October 20, 1929; “Notables to Attend Milk Fund Bouts,” New York Times, June 26, 1929; “Fight Broadcast Heard by Millions,” New York Times, June 22, 1932. 27 “Evens, Brook Club Proprietor, Dies in New York City,” Saratoga Springs Saratogian, February 6, 1935; “Nate Evens Left Half Million and No Will; Son Heir,” Saratoga Springs Saratogian, February 10, 1935.